AI War Beta 6.024-6.025 "The Squeaky Wheel Gets The Buff (or Nerf)" Released! This one ... does a lot. 1) Turrets in general. The combat stats are something of a sidegrade, though on the buff side of that line. The main thing here is bringing their K costs down (as well as making them more regular across different turret types). 2) Command station upgrades (like the MkII Economic Command Station, etc) now also provide a hefty bonus to your homeworld in the form of a foldout that provides the same benefit as the unlocked station. These are cumulative, so unlocking mkII and mkIII military command stations and mkII logistical command stations will put both a mkII military, mkIII military, and mkII logistics foldout on your homeworld. Incidentally, that gives everything on the planet a +100% to firepower and completely negates AI cloaking on that planet (both from the mil III) as well as slowing down enemies (from the log II) so that might not be a bad idea. If it didn't cost an arm and a leg in Knowledge, that is. 3) The Mobile Repair Station has taken over the Enclave Starship's role of fleetship production in the field (which incidentally makes that a base-game ability now, for the two of you who don't have CoN), been officially renamed the Mobile Space Dock, and come down from 4000 to 3000 Knowledge. 4) Speaking of the Enclave Starship, it needs to stop winning these polls ;) So it's been reinvented a bit. As mentioned above it no longer builds fleet ships in the field. It also no longer builds its unique-to-the-Enclave drones in the normal fashion, but instead generates them automatically much like a Spire Blade Spawner or Tackle Drone Launcher. The result is something much easier to use for just getting stuff dead and something much closer to the original "carrier" inspiration behind the Enclave Starship. K costs have also been adjusted to match most of the other starships. 5) The MkII Transport is now the Assault Transport. Basically the MkI Transport does such an exemplary job in the "Ship Bus" role that there wasn't much reason to spend 4000 Knowledge on a better transport. So the Assault Transport now provides several new tactical options through: cloaking, guns (that get stronger the more ships are loaded in the transport), instantaneous unload, more durability, and not delaying the first shot of unloaded ships as long as the MkI does. We'd also toyed with the idea of it dropping a shortlived forcefield on death, but that seemed a bit too gimmicky and a bit too easy to cheese (without still more gimmicks to prevent the cheese). Knowledge cost is now 3000. A pretty good haul of buffs for the human side, eh? Well the AI isn't happy. Not a bit. A few key improvements to carrier/cpa logic should help make those more "interesting", and the AI's response to Knowledge Hacking has been... augmented, you could say. You won't notice much difference in the first K hack, and maybe a minor difference in the second hack, but from there on it can get considerably more dicey. None of this "9 Knowledge Hacks on Diff 10" shenaniga-tomfoolery, to use an example which is obviously hypothetical and not at all related to a recent AAR win. Also we've tuned the recent Starship buffs back a bit as they were very much getting into the territory of overshadowing fleet ships despite the lower "total" available. This set of changes is relatively mild and some people think more tuning back is necessary, but some don't, so we'll see. Based on a lot of thought and player feedback that the game was simply being too nice on this one point, Advanced Research Stations no longer grant mkII of their bonus type for free. Instead they give 500 bonus Knowledge immediately upon capture. Also, though not for strictly-related reasons (having more to do with not saddling mkIII price balance with the adv-factory question) mkIII fleet ship cost has come down from 6000 to 4000. The result is that if you normally unlock mkIII of every ARS bonus type you'll see absolutely no difference in total K expenditure (-500 + 2500 + 4000 vs 6000), but that if you don't it's something of a nerf. The release contains a few other changes as well, notably the addition of a couple control toggles that should make life more pleasant for people wanting to "automatically dump any resources over 1.5M metal+crystal into mercenary production (or building that fort or trader toy, or whatever)" or "don't let cloaked or immobile AI units prevent automatic harvester rebuilding". Update: 6.025 hotfix to fix a bug preventing most foldouts from spawning in multiplayer. This one congratulates the 4 winners of our recent "bug of the year" poll by... well, exterminating them. Sometimes it's tough being the winner. #1 was a longstanding-but-not-really-noticed-until-recently problem in the mapgen logic causing all Advanced Research Stations, Fabricators, and various other (though not all) capturables to seed only on planets controlled by the first AI player. Normally this didn't matter a whole lot, but if the first AI happened to be a really annoying type (Scorched Earth, notably) the pain was... noticeable. Anyway, several bugs were involved but mapgen is now more equitable in that regard. #2 was another longstanding problem with how the preferred-target rules (where stuff you give a direct attack order to should prefer to shoot things similar to the designated target) worked when attacking Hybrids. It turns out that the problem basically applied to anything with a modular forcefield and there were also some problems with focus-fire and preferred-targeting in the general case. Normally I wouldn't have spent hours chasing something like this down because I perceive other things as being more important to the community, but the poll was helpful in correcting that perception. So this stuff is quite a bit tidier now. Not a great time to be a Hybrid, I suppose. #3 turned out to not even be a bug: complaints that nothing was happening to go with the "Defensive Hybrids Are Mobilizing" message that can show up when you have Advanced Hybrids on and a CPA or exo or such happens. In the test case I saw the defensive hybrids were indeed switching to offensive types, but they still didn't have enough firepower to think they had a chance so they continued not-attacking. That's by design, as otherwise they just all charge to their deaths (more than usual, I mean). Nonetheless, this "mobilization" mechanic has been beefed up to be more noticeable. Maybe not such a bad time to be a Hybrid, I suppose. #4 was updating the turret types to work nicely with ultra-low caps by changing them to have base caps divisible by 8. Rounding up all the stats for those into the newer more cap-oriented model took time, but it's done now. Which is good, as there's noises being made about rebalancing turrets in other ways. We'll see. There are several other bugfixes and balance changes in this release. Notably, the exponential scaling of wave size with AIP on Diff 8+ has been removed after several months of feedback on it, and balance iteration continues on the nebula scenarios. Update: 6.023 hotfix to fix an unhandled-errors bug in the last version with auto-load. Just a quick reminder that both the AI-war featured IndieFort Spring Bundle and the major Steam discounts on our full library of titles are available for just a few more hours, so act quick if you haven't already! Valley 2 Official 1.004 "Endless Lightning" Released! This one addresses two minor issues, and a third issue that could make the end of the game excessively hard to complete under certain circumstances (on higher difficulties in particular). This is a standard update that you can download through the in-game updater itself, if you already have any version of the game. If you have the beta on Steam, it will automatically update for you. When you launch the game, you'll see the notice of the update having been found if you're connected to the Internet at the time. If you don't have the standalone game, you can download that here. If you already own the first game, just use your existing license key to unlock the sequel for free! 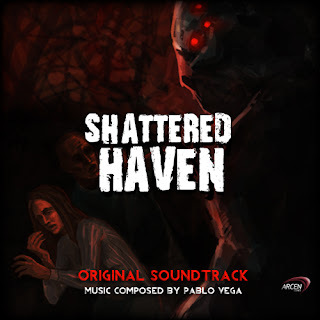 Shattered Haven 1.010-1.011 "Squid Anomaly" Released! This one is just a couple of minor tweaks, as well as a fix for a more important bug that only affected people with really unusual framerates (so very much an edge case). UPDATE: 1.011 fixes a bug that was introduced in 1.010. 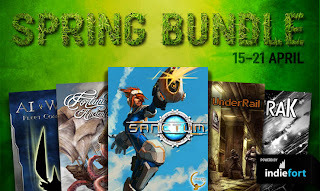 Steam's put the whole lot on sale this time, and I mean everything. For the next week, you'll find the entire Arcen library slashed down to very low prices. Sale ends April 22nd. 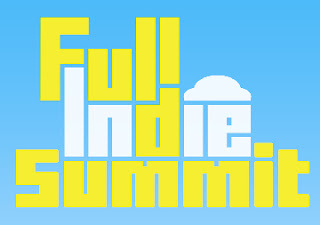 I'll be spewing my nonsense at the Full Indie Summit in Vancouver, BC this Saturday (April 20th). More specifically, I'll be giving a talk on indie game marketing plans. If you're local to the area and are interested in checking it out, definitely stop by and make sure to say hello. The event goes from 10 AM - 4 PM, and admittance is dirt cheap ($10 Canadian) -- plus I hear there's a mixer or two going on afterwards. Should be good fun! I've set-up a host of new fan pages for Shattered Haven, Exodus of the Machine, and Skyward Collapse -- for those interested in receiving game updates on sites like Twitter, Reddit, and others of the sort. AI War Beta 6.019-6.021 "Nebulous Diligence" Released! This one is pretty broad. Most importantly, the AI will now a one-time launch retaliatory attack when you destroy each core guard post (unless Lazy AI is on). Given that your mobile forces are probably entirely engaged on the AI HW at the time, and that the attack can come from one or more warp gates pretty much anywhere in the galaxy, this could be... uncomfortable ;) You could of course pull your mobile ships back before actually landing the kill shot on a core guard post, but that takes time during which the normal AI response has time to work (and each core guard post you kill increases the AIP floor by 10, so even if you started the assault at low AIP you may find you don't have the luxury of flying back and forth for each core post kill. Or even of waiting for each post's retaliation to be dealt with before killing the next one. On the other hand, for those wanting a less vigilant AI the Lazy-AI toggle now also disables the "deepstrike" logic which causes threat to spawn constantly while you have military ships several hops deep into purely AI territory. Combined with the other factors this definitely moves the Lazy-AI toggle into the realm of "if you play with this, balance is up to you" in that you'd need to turn up the difficulty in other ways or it's just going to be a lot easier than a "normal" game, but it's there for those of you who like getting your challenge some other way or simply like trying to win with only one your HW or whatever. Another important change is that now the AI's normal reinforcements stop getting stronger past a certain (difficulty-based) AIP threshold. We may need to add some compensation for this later (intensifying its offensives past the threshold, probably) but for now the idea is that if you cross into the AIP "death zone" it should just kill you via some offensive mechanic rather than stonewalling you with a huge wall of entirely defensive ships that regenerates faster than you can kill it. Stalemates like that have a long and storied history in AIW, and that's not the end of the world, but many people have complained about that over the years and if we can move towards something that's more likely to avoid those (in favor of moving the game towards a conclusion one way or another) then that's probably a good thing. This release also contains several bugfixes and other balance changes, all mentioned in the notes linked above. Most notable of those is a fix for the longstanding bug with the "AI units should wait at least 30 seconds before retreating" rule not working. Now your chipper shredders will have a little more time to work! Update: 6.020 hotfix for a bug in recent versions where scouts could not be directly sent through unexplored wormholes when the everything-starts-unexplored toggle was on. Update: 6.021 hotfix to fix a bug in the AI-retreat-behavior "fix" that was causing errors on the AI thread. AI War Beta 6.017-6.018 "Defending The AI's Front Lawn" Released! This one makes the AI a little more enthusiastic about its job of, well, not dying. Previously people have really been encouraged (on high difficulty, at least) to keep AIP absolutely minimally low during the entire game. And it's fine (and encouraged) that you keep it low most of the game, but the AI homeworlds were not causing the kind of effective AIP increase that one might expect when you make a serious bid to, you know, kill the AI. Sure, actually killing an AI Home Command Station used to give a whopping +100 AIP, but most high-difficulty games seem to end with both of those being killed at basically the same time, after the player has been fighting on the AI homeworlds and killing core guard posts for quite a while. Seems like maybe the AI should object a bit more while you stand on its front lawn(s) lining up a double headshot, don't you think? That said, we didn't want to totally take away the ability to play that way, as there are plenty of other ways players can (and do) make the game harder to compensate. 1) The strategic reserve (which primarily exists to defend the AI homeworlds) has a static strength equal to what it used to be at 200 AIP. So attacking with less AIP than that won't save you any strategic-reserve-releated grief. 2) Killing a core guard post (one of the guard posts actually on an AI HW) increases the AIP floor by 10. There are 8 posts on each AI HW so your absolute minimal AIP floor when the last one goes down is 170 (due to the starting 10), and in reality you'll have more than that due to normal floor increases. So there won't be much point in starting a homeworld assault with AIP much lower than that. The combined effect is that you'll generally need more power than you used to to actually punch out an AI HW (due to the strategic reserve), and if you've been playing low AIP through the midgame you'll have "may as well use it" AIP room due to the core-post floor increases. Also, the AI's response will actually ramp up during the homeworld assault phase, instead of staying mostly constant. So get off the AI's lawn. Or just turn on the Lazy toggle and it will stop waving the shotgun around as much. Oh, we also fixed some bugs in this release; mostly from the nominations for our first "bug poll". A poll, incidentally, that I'm not sure I'm going to post because I'm not sure the voting options will make sense to folks, but we'll see. Update: 6.018 hotfix to fix a bug preventing sending champions into unexplored nebulae. AI War Beta 6.016 "Deflecting Attraction" Released! This one contains over a dozen significant balance changes and bug fixes. Not as dramatic as some previous releases but combined these have a fairly big impact. The "Deflector Drone" bonus fleet ship has been renamed to "Attractor Drone" along with a number of buffs to bring it back from the realm of infamy. The name change is due to our replacing its "reduce all laser damage to nearby allies by 75%" mechanic with "all laser shots fired at nearby allies target the drone instead", not very unlike the special mechanic of the Youngling Weasel (or Decoy Drone). The capturable Advanced Factory, Advanced Starship Constructor, and Fabricator structures have been buffed in two important ways: mapgen will now put them in more defensible positions, and they now work much better with human intra-galactic warp gates. Now the MkIV ships produced from the Advanced Factory and Advanced Starship Constructor (and the Mercenary Space Dock, while we were at it) only get 4 or 8 seconds of paralysis instead of 1 or 2 minutes (the longer time being used on non-friendly planets). And the ships produced from the Fabs experience no post-warp paralysis at all. Our hope is that this will help these structures be more attractive to the player due to the reduced logistical difficulties. There are still issues with defending these on games with exo-sources, but that's a trickier problem (even in determining whether it _is_ a problem) and can be addressed later. If you've been bashing your head on the desk over the recent buffs to the normal AI guard posts, don't despair, we've fixed a balance oversight where they were countering their triangle-counters. So now when you bring in the countering triangle type you won't take nearly so many casualties. Of course you don't always have the luxury of having the right type on hand or leaving everything else behind, but that problem is left as an exercise for the reader. In addition, we fixed a longstanding issue with mapgen that was preventing the internal planet-strength-differentiation logic from really having any impact on guard post count. Not that it mattered much before the buffs, but now that guard posts can actually hurt you it's nice when normal AI planets don't all have the same number of guard posts. For that matter, if you want to just path through the lower-post-count planets on your way through, that's now possible in many cases. Speaking of pathing, we've added a long-requested option to the per-planet controls: "Avoid Pathing Through This Planet". We hope this will save much frustration from galaxy map movement orders sending entire fleets through the wrong (but quickest) wormhole only to be swallowed by a small dog (or a not-so-small superfort). This one is just a couple of minor bugfixes. 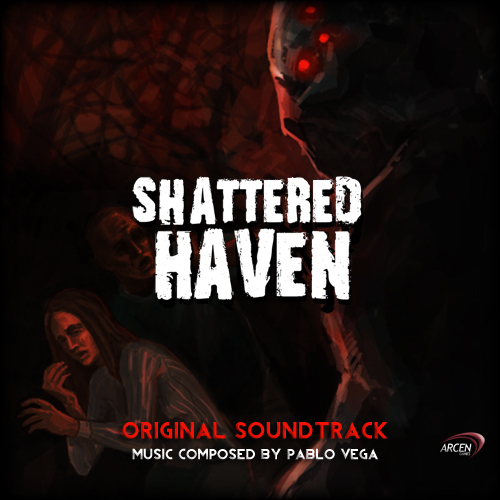 Shattered Haven is something that people who are playing it really seem to love, but we're really having trouble getting the word out. If you play it and love it, please spread the word! We can use all the help we can get. A huge thanks to all of you who have already done so. This one has some various fixes and tweaks, but the main thing is to make the Phoenix Forest a bit quicker to traverse on your first time through. No levels have been removed, but two regular levels are now bonus levels, and are behind "combination doors" that you won't be able to open until much later into your adventure. This gets you past two levels that were a bit frustratingly slow and/or fiddly, and into the coolest early part of the adventure, which is Stantonsburg, more quickly.